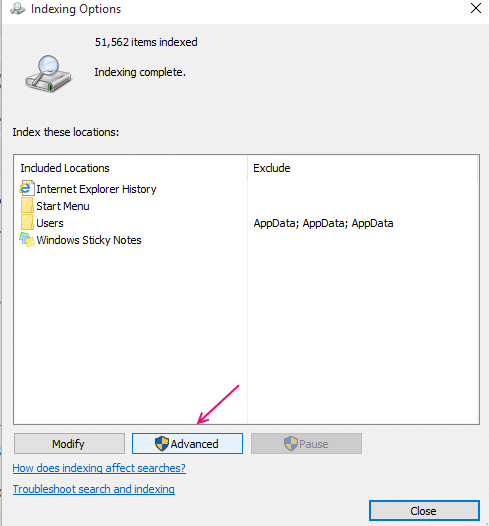 In Windows 7 or Windows 8, we have seen the high usability of search engine indexing to find important files in folders in our directories (Local Disks). Windows 10 also comes up with this feature. The search engine provides optimum search results in the user’s folder (basically located on hard drives), E-Mails, Start Menu and OneDrive folder (offline files and folders locally stored in the hard drive). As the search mechanism yields better results in Windows 10, sometimes we get results like broken results or missing files in the search result page. If the search is not up to expectations or it is having difficulties during execution, you can easily solve its searching issues by using the search troubleshooter or rebuilding the search engine index manually. 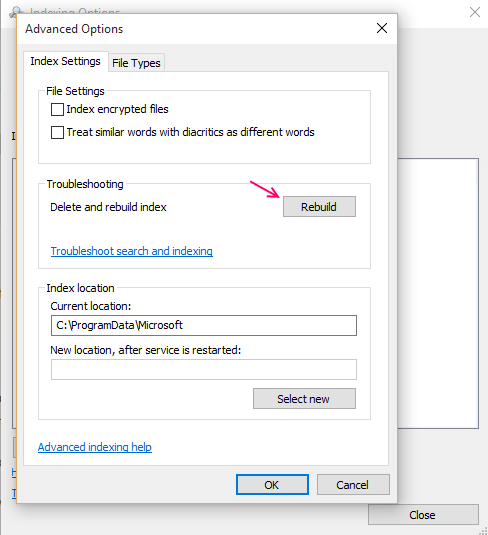 In this article, we will know how to rebuild the search engine index manually to fix windows 10 search & how to execute the search troubleshooter in order to solve the search engine indexing problems in Windows 10. 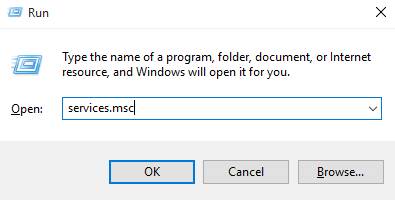 Press the “Windows Key+R” to open the Run dialog box. 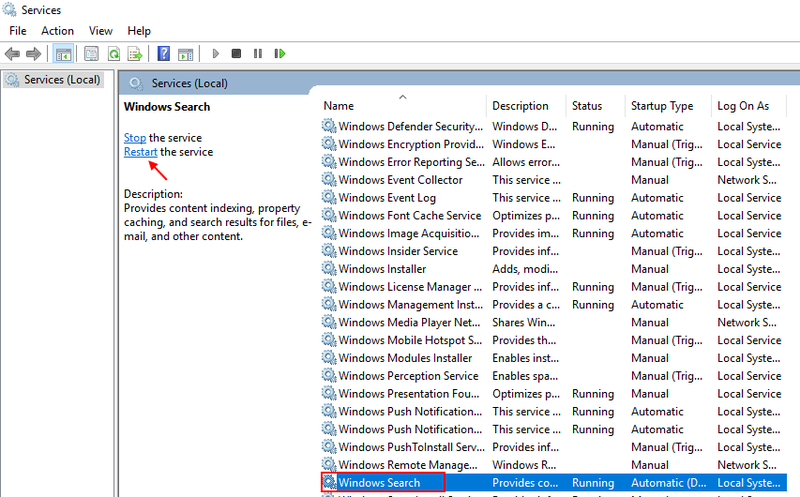 Type “Services.msc” in the command box and Press Enter to open the Service manager Page. Now, Double click on “Windows Search”. The other columns in the Windows search display its Description, Status, Startup Type etc. In the Status Column, it will show its status (whether it’s running or stopped). If it is stopped due to some reason, make it sure that it’s in a running status. 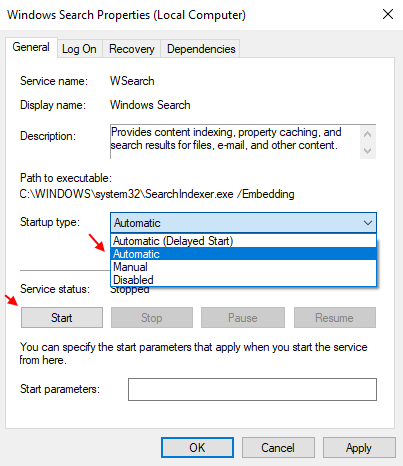 If Start the service Option is active, just click start to start the service, if it is not just restart the service. Do check By double clicking on it , whether the Startup type is showing Automatic result. If it Not, then Choose startup type as Automatic and click on start if the button is active. 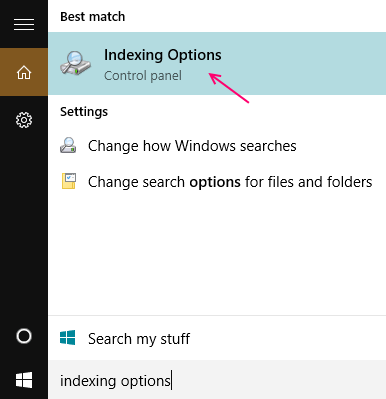 In Windows 10 search box , type “Indexing Options” and press Enter. Alternatively go to “Control Panel” and search indexing options in search box. Then Click on “Indexing Options” icon. When you open the “Indexing Options”, click on “Advanced” button to open “Advanced Options”. Now, below “Index Settings” tab, you will see a Troubleshooting section. This section contains a “Rebuild” button. Click on “Rebuild” button. This will help in Rebuilding the Search Engine Index. After clicking on it, you will see a confirmation message displaying “Rebuilding the index might take a long time to complete. Some views and search results might be incomplete until Rebuilding is finished”. Click on the “OK” button to allow Windows 10 to enable Rebuilding the Search Engine Index. Note: This step may take couple of hours for completion of whole process, but in most of the cases it is completed within 5-10 minutes or less. Step 1: Open settings by pressing windows key + I together. Step 2 – Now, Click on Update & Security. 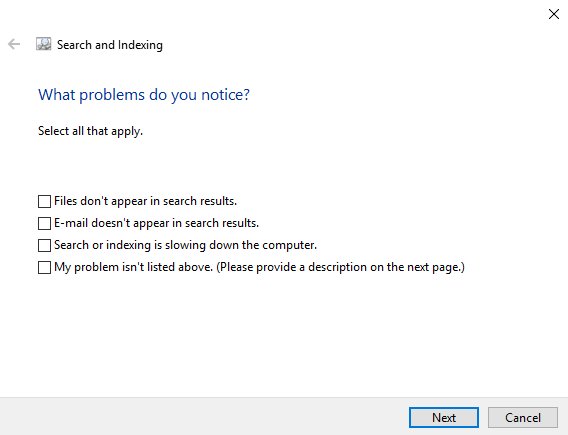 Step 3 – Now, Choose Troubleshoot from the left menu and then click Search and indexing from the right side. Step 4 – Now, click on Run the troubleshooter. Now, you will see “What problems do you notice?” section with multiple check boxes. Select the suitable boxes prior to clicking the “Next” button to make troubleshooter recognise the problems and mend it, if possible. 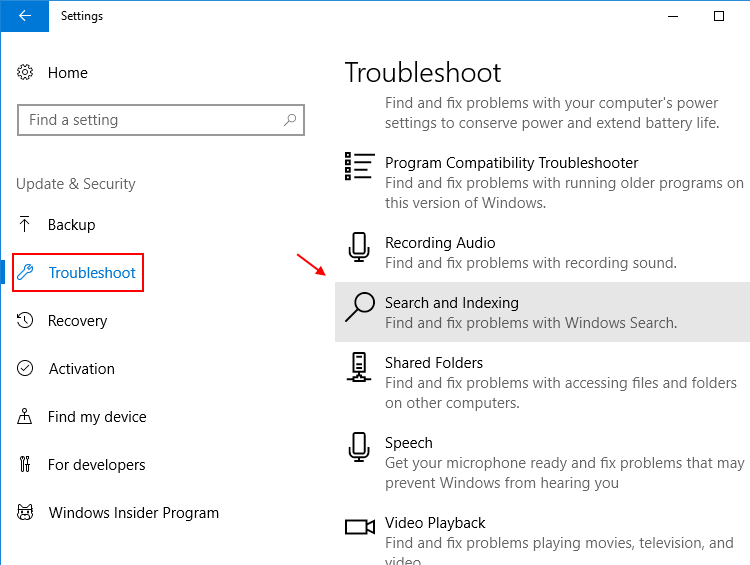 If the troubleshooter does not identify to analyse and repair the problems, please contact http://support.microsoft.com through the Contact support app to this issue.